Despite its integration into mainstream art, traditional textile crafting practices often struggle to coexist with a contemporary aesthetic, particularly in relation to painting. More frequently engaged as a conceptual prop in contemporary art, quilting and weaving are made to be more symbolically powerful than technically or texturally engaging. Following in the footsteps of Sheila Hicks and Rosemarie Trockel, Danielle Mysliwiec involves weaving technique in her paintings, often employing strands of dried oil paint as strings to manipulate into pseudo-textile surface across the canvas. Her ability to pull these methodologies into her painting practice seamlessly, and seemingly without irony or cultural reference, is a trait that her allows her to stand apart from explorations in the same vein. In Quatrain, her current exhibition at Vox Populi, Mysliwiec presents eleven refined canvases featuring various explorations into the optical and textural properties of oil paint, linen canvas, and metallic surfaces. 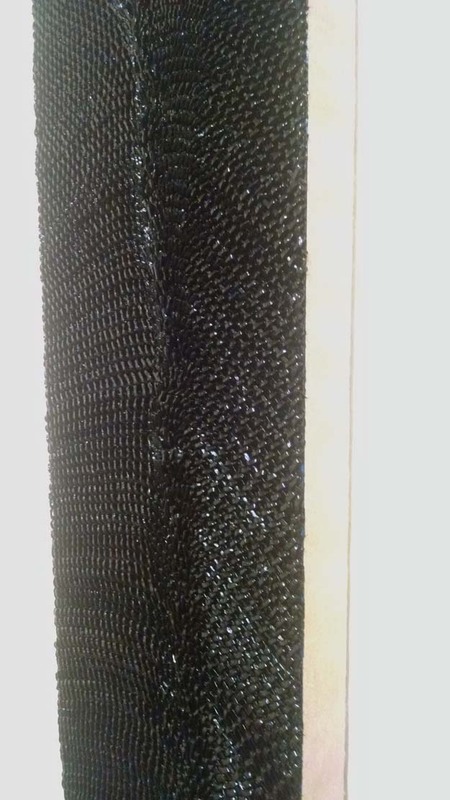 Constituting four specific groups of paintings that each employ a specific methodology and process, Quatrain engages both Mysliwiec’s consideration of Modernist compositional aesthetic and the construction involved in weaving and quilting technique. Her absorbing and evocative process is freely articulated on the canvas, ordered and regulated by a painter’s formatting. 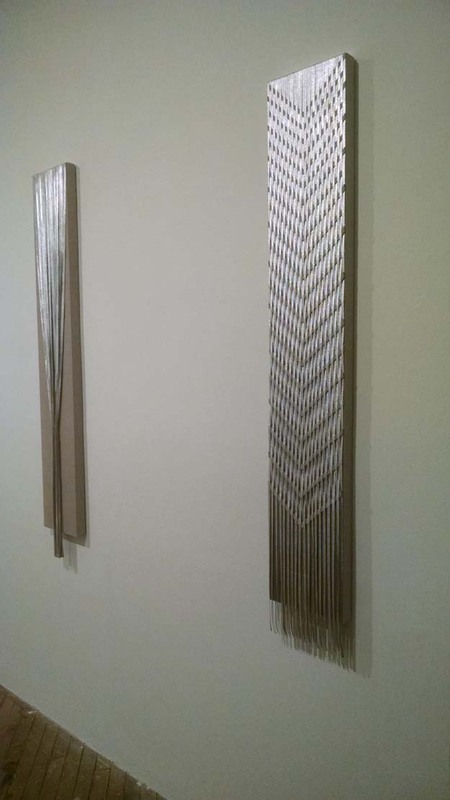 One trio of long, languid compositions based on 60 x 9 inch untreated linen canvases features leathery strips of metallic linen, resting in loosely ordered variations. 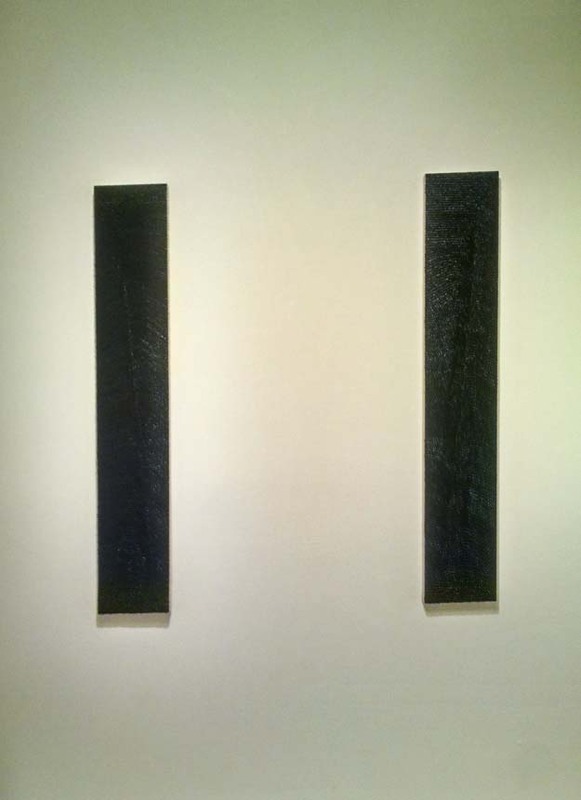 A pair of equally long, thin canvases – Nocturne I and II – hang on the adjacent wall, covered with a dense weaving of thin, almost rubbery strands of oil paint, creating two variations of mesh netting across their surfaces. 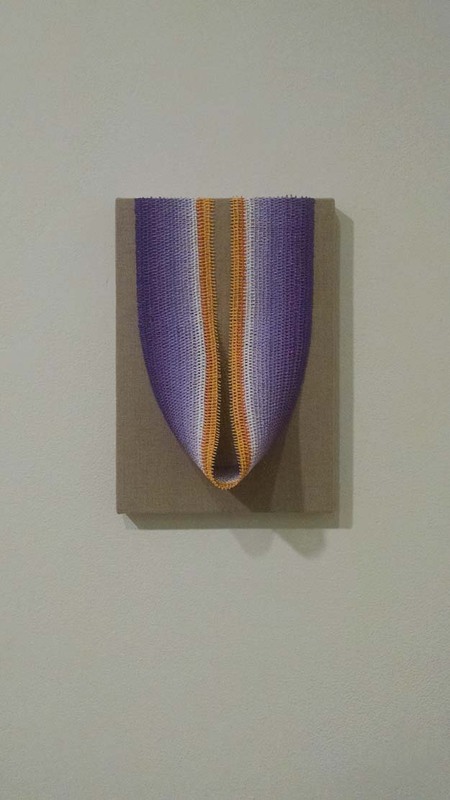 In a series entitled Crocus, Mysliwiec allows this fabric to drape leisurely across raw linen canvases, the paint arching and untethered to the surface and creating a gentle loop, enhanced by a gradient of purple emanating outward. The dynamic qualities of woven surface are illuminated by the sheen of the paint and Mysliwiec’s control over tension – at times buckling and bubbling, other times easily laying flat. The difference between these compositions both in optical complexity and physical sensibility is incredibly engaging and energetic. 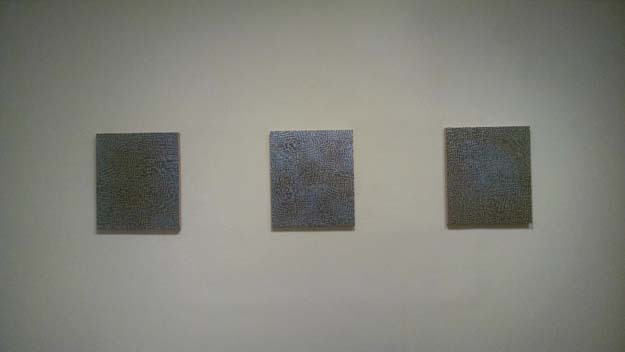 The one trio of paintings without a three-dimensional element is entitled Equinox, and features semi-hypnotic grids of triangle and diamond shapes in deep blue and silver metallic paint over a gilded panel surface. 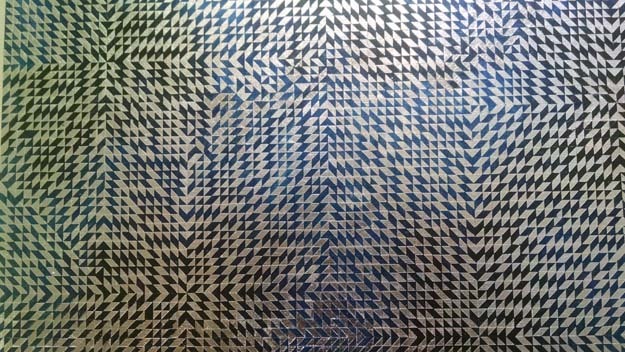 The complex, disordered geometry and distorted tessellation of these compositions reference Amish quilting patterns, but they are taken to an almost psychedelic extreme when viewed at close range. Like Mysliwiec’s other compositions, the chaos is neatly contained within a clean rectangle, activating a tension between surface and space. Mysliwiec succinctly expressed her relationship with weaving in an interview with Dwayne Butcher earlier this month, describing an experience in graduate school while developing her technique: “One of my professors saw a study [of a woven piece] and said, ‘you know, you really need to think about whether or not you want the work to be read with the history of women’s work and weaving and craft… bla bla bla.’ … I came to weaving primarily because of its system, its relation to the grid […] and because of its poetic/metaphoric possibilities.” While she later acknowledges the importance of this consideration, it is clear that she is much more focused on the format and physicality of her technique rather than its political history in the art historical narrative. It becomes part of her formal language. This comfort and flexibility in the incorporation of new methods – through a fascination with their process, regardless of their provenance – is such a welcome perspective in an art world frequently entrenched in outmoded conceptions of fine art versus craft. In his already infamous review of Michelle Grabner’s recent solo exhibition, Ken Johnson betrays his contempt for imagery of craft and domesticity in a sincere context. In a few lazy jabs at the artist’s perceived “soccer mom” aesthetic, Johnson reduced Grabner’s long-time investigation of the algorithms behind image creation through weaving to an obsession with her son’s kindergarten art project. That a crafting tradition can do so much to taint, dictate, or otherwise inform a piece in this fluid postmodernist context could be alarming for an artist who sees value in an engagement with craft in her process. However, from Mysliwiec’s flexible approach – and a seeming disdain for and disregard of this kind of cultural limitation– it is clear that she is unconcerned with the inevitable connection, and destined to subvert this kind of restricting rhetoric.